The onset of a saccade at t = 0 seconds appears to push the electrical activity in the hippocampus (blue graph) to have a more coherent theta rhythm. The multi-colored panel shows which oscillation frequencies are strongest at each time point. Quick eye movements, called saccades, that enable us to scan a visual scene appear to act as a metronome for pushing information about that scene into memory. Tracking eye movements is already a promising basis for diagnosing brain disorders such as Alzheimer’s disease and schizophrenia. A deeper understanding of how the rhythm of eye movements orchestrate memories could bolster the accuracy and power of eye-tracking diagnoses. Senior author Elizabeth Buffalo, PhD, was a researcher at the Yerkes National Primate Research Center and an associate professor of neurology at Emory University School of Medicine and is currently associate professor of physiology and biophysics at University of Washington in Seattle. The first author of the paper is postdoctoral fellow Michael Jutras, PhD, who is now an instructor at the University of Washington. She says the actions that are most comparable to rodents’ sniffing and whiskering in primates are saccades. When our eyes scan text or explore a picture, the eyes’ focus tends to jump from point to point several times per second. The research was supported by the National Institute on Aging (AG025688), the National Institute of Mental Health (MH080007, MH093807, MH082559), and the NIH Director’s Office of Research Infrastructure Programs (Primate centers: P51OD1132). Reference: M.J. Jutras, P. Fries, and E.A. Buffalo. 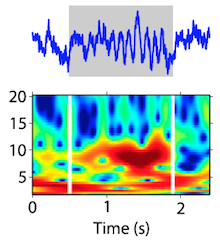 Oscillatory activity in the monkey hippocampus during visual exploration and memory formation. PNAS Early Edition (2013).